I have a juvenile record. What can I do? Having a juvenile record can make it harder to get a job and can create barriers to your future plans. Some people think that juvenile records are sealed and no one can see them. Expungement means that your juvenile record is erased and no one can see it. If you want to ask the court for an expungement, you have to file a motion. You can do this with a lawyer’s help or on your own. For help filing a motion for expungement, contact your public defender or probation officer. Are juvenile records automatically expunged after a certain period of time? No. To destroy a juvenile record, the subject of the record or any other concerned party must petition the court for its expungement. 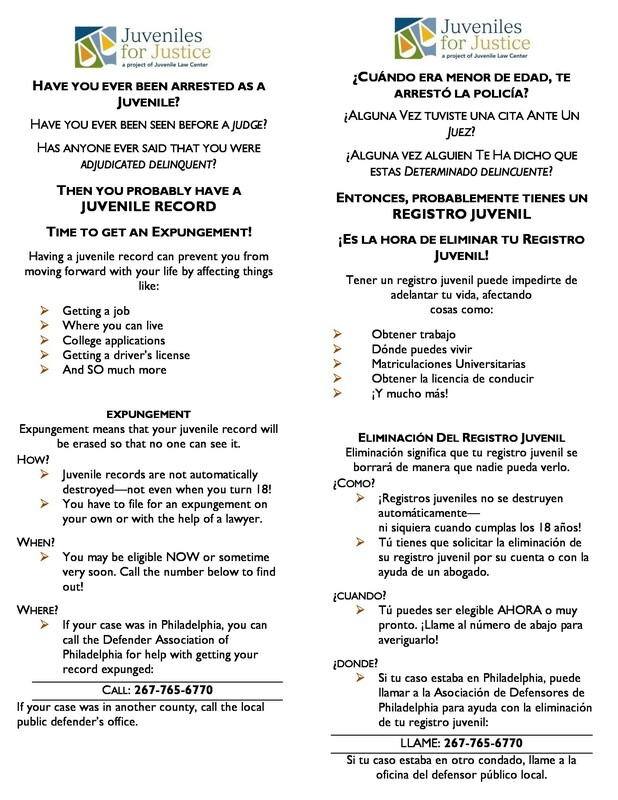 Am I eligible to have my juvenile record expunged? 1. The complaint is not substantiated (for example, found not guilty) or is dismissed. 2. Six months have passed since your final discharge from supervision under a consent decree and no juvenile or criminal charges are pending. 3. Five years have passed since your final discharge from commitment, placement, or any other disposition and no further charges have been filed or are pending. Who can file the petition for expungement? Some public juvenile defenders will file a petition for you. Call your county juvenile defender office to find out if you may be eligible for an expungement and if their office will file the petition for you.